Inside a chapel at the church of St Gildard, St Bernadette lies in a glass coffin. Exhumed thrice, her body showed no decay and was well-preserved. She has laid in her crystal resting place since 1925. (Click on the map image above to enlarge it, then click once again using the magnifying glass icon to zoom in on an area). `I was totally enhanced with the movie “The song of Bernadette” when I first seen it in 1963,needless to say I also own a copy, and taught all my grandchildren about Saint Bernadette.I will never be able to visit her,knowing all that I do know about her, leave’s me privalged in a holy way. problems one might encounter. Enjoy your trip. My name is Jean Paul Bayou. I went to visit ST.BERNADETTE before my Kidney Transplant Operation in 2012. And I did make a promise to her and said if I am succeded in the Operation, I will come to visit her again. The first time I came over with my Brother and sister. This time I would like to come on my own to pay my respect personally to ST.BERNADETTE. Would you be kind enough to guide me how to get to Nevers by EURO STAR please. and the Sisters of Nevers at the St. Gildard convent. When I was there in 2012 it was if I were in a holistic blister of peace. I felt so alive and my heart was filled with love and warmth for all to see. The trip here from anywhere in the world is worth the time and effort. I shall never forget standing next to her as she sleeps decade after decade looking like she might awake anytime. If only everyone could see her perhaps the world would not be such a wicked place. God Bless all of you who read this. benefit from a lot of the knowledge you give here. Feel free to let me know if this would be fine. As long as you cite the source back here to Travelling Cam, that should be all right. Do provide us a link. Thanks. Nobody could know the secret that dwells in my home here in America, because I know few would believe me, but if anyone is willing to believe that God rewards huge blessings to all who ask, my secret would be revealed, this secret is connected to none other than your Saint Bernadette, but the secret will only be revealed if someone truly is willing to believe. I will reveal no more unless someone does. Its very easy to get from Paris to Nevers, from Brecy or Gare de Lyon, to make the most of your day trains depart around 7.00am arriving Nevers between 9.00am -9.30am. The convent is not far from the station, just follow sigs saying Espace de Bernadette, or easier still just get a cab! The chapel where Bernadette lies is closed between 12,00 0 2.00pm but the gardens museam are still open. You can rent a little guide book from the Nuns. You can picnic lunch in the grounds of if you exit the gate next to the gatehouse and walk through the park there is a cafe less than 10 mins away. There is not much to see in the town. Hope you enjoy your visit, God bless. Its a long time now that I’ve visited Lourdes/Nevers and haven’t been too clear of what order the convent of St. Gilard belongs to – could you tell me please which order it is? I believe that she was at school with the Benedictines? is photography allowed inside the convent,. ..i.e. to take photos of st bernadette..
Hi Richard. No, it is not allowed to take photos of St Bernadette. Hi Judy. Some of your questions have been previously answered here. Please read the comments below, especially by Bill Waters. I visited there in 1965 ( Lourdes) and i am 100% sure that her body was on display in the church there. That would have been in the summer of 1965. I cant seem to find info on the body ever being on display other than Nevers.? Hi a friend and I planning to visit Lourdes in April, and thinking of going to visit Nevers as well when we back from Paris. Can anyone tell us if the convent or the chapel opening time , especially on Sunday. The convent is open on Sunday, closed at lunchtime 12.00 – 1.00 or thereabouts. You can also stay in the convent if you contact the nuns in advance. Google Convent of St Gildard and you’ll get directed to the website. Enjoy your visit, email me if you require anything else. This may seem like an unusual question, but can you tell me if there have been any recent appearances by our little seer in recent times? I know Mary appeared to Bernadette, so is it possible for Bernadette to have made an appearance in some way at the convent. Did anyone see her? Hi, I have been going to lourdes every year since 1995 and would like to visit st gildards to see st Bernadette, What is the closest airport to it ? I would be flying from england using either manchester or Liverpool airport . We are planning to be st the St. Gildard Convent/St. Bernadette in Nevers by August 9th and 10th of 2011. May we have the activities for those days? Today is the 11th of August …. is it difficult to find taxi from the convent to train station ? how far is the taxi stand from the convent ? There is a telephone number to call for a cab. Please inquire at the information desk at the convent. But if you are able, the convent is walking distance to the train station. See the map on this site. Hi. Will be in Paris Aug 29 and 30 2011. Departing Paris Aug 31. Can we do a day trip from Paris to Nevers on Aug 30? Is it easy to book a train – back and forth? We do not speak French…..
How far is the Chapel of St. Gildard from the train station in Nevers? How about the Paris Brecy station from the city (Paris) itself? Hi Ck. This is a photograph blog, not a tour website. Some of the questions you pose here are answered in the comments. There are readers of this site who can assist you with your trip. Please contact Bill Waters directly at bdwaters@hotmail.co.uk — Most information on the internet is free, but do express your gratitude to people like Bill with some financial token of thanks. His experience and knowledge will make your trip that more enjoyable and better organised. On his behalf, thank you. By the way, I am the writer of this photoblog and I really appreciate the informative contributions of people like Bill Waters on this post. St Gildard’s is a convent and does not have a resident parish priest. who is the parish priest of st. Gildard.What is jis name? who is the parish pastor of st. Gildard? hello dhh or anyone else that could answer me please. Is there a direct train ride from Lourdes to Nevers? We will be in a bus of about 50 (with a Priest) and pass-by St Bernadette Chapel, St. Gildard on June 13, 2011 from Lourdes. Anybody can tell me the telephone number of the information in the convent there so that we can ask for permission or if we can celebrate mass when we come? can somebody tell me the address of this convent – the St. Gildard convent. if you know also their telephone number and their e-mail adress please e-mail them to me ASAP. I would like to book a room for early April. We have one free day in Paris so we are planning to visit St. Bernadette. I’m just wondering if the church will be open on late december (29th,30th,31st of december or 1st january). What would be the best date to visit? Also is the church within walking distance from the station? and do you know if there is any local tour to take us around the historical and pilgrimage places in nevers? Paris to Nevers and then to Lourdes or Paris to Lourdes then to Nevers? Your travel times Paris to Nevers on Saturday are limited. I’ve looked at this for you. Trains are direct, no changes required. This is the earliest train you can get back to Paris that day. Take an early morning train from Paris to Nevers. If you are able you can walk to the convent or take a taxi from the station. The chapel where St Bernadette lies is closed from 12.00 noon until 2.00pm. You can explore the gardens and the little chapel (St Joseph’s) where she was buried outwith these hours. You can get a guide book for a couple of euros from one of the nuns. I hope you will have a wonderful pilgrimage, please say a prayer for me when you are there. Eileen, you dont say where you are travelling from. If you contact me via bdwaters@hotmail.co.uk I’ll try to help you. I have been to Lourdes & Nevers many many times (I work as a volunteer courier/guide) I will help in any way I can. I would like some more information on how my Aunt and I can contact other folks interested in touring Lourdes and St. Bernedette. It has been my life’s desire to see her and the holy place she saw our Mother Mary. Could you please email me back with a website I could contact? My name is Christy from Indonesia, I’m a tour operator for pilgrimage from Indonesia. I would like to propose a mass request, Can I book with you?? Name of Priest : Pastor Franz Cornelius Liman CICM. Thanks for your kindly co-operation, God Bless.. Considering the date of your group’s arrival (July 10, this Saturday, no less), I strongly suggest you call them for a confirmation of whatever booking arrangement you need to make with them, and then follow-up with an email or fax. Or contact Bill at bill@danyboy.plus.com who can assist you with pilgrimage arrangements. October is fine, if you contact the convent in advance you could likely stay there. Though there are plenty of hotels in Nevers. There are guide books in all languages to assist you round the grounds. Have a wonderful time, it’s beautiful, and so is St Bernadette. Thank you DHH for your speedy helpful reply. Hi, Could anyone tell me if October would be a good time to visit Saint Gildard’s? and would the guest house/pilgrimage house be open then? I tried to find out on their website but it’s mostly in French which I do not understand. I would be grateful for help. … where it mentions that it is open all-year round. I don’t know if October is a good time, but perhaps a reader here can advise you on that. Hello Iva. This is but a humble photoblog, a recording in images of places visited. Please inquire at the link you posted in your comment, although I’m afraid correspondence could be in french. Otherwise, perhaps a reader here can assist you in your quest. I believe in God. and I have many dreams and desire in life but most importantly for me is to become a nun and why not in your assembly. Can please direct me as you can get to become a sister of your assembly. Help me please. Could any one help to give us the email address, for making an appointment to make a Holy Mass at St Gildard. The group will come along with a pastor. We will be traveling from Spain up through France and plan to stay in Nevers just so we can visit the chapel does anyone know if it is open on Sundays and if so the times for visit. they are open from 10 am to 12 noon and then from 2 pm to 5 pm. Regarding the Internet site, Bernadette, The Sisters, The Congregation, the Archives, A prayer…. For information regarding Retreats, Pilgrimages, Seminars and other events, the CIRRH, places available and price lists, The Shop, Timetables, Masses…. It would be best for you to take the train back to Paris, and from there, take the train to Nevers. Take a night train from Lourdes to Paris, and then take the 2 hours train from Paris to Nevers the following day. 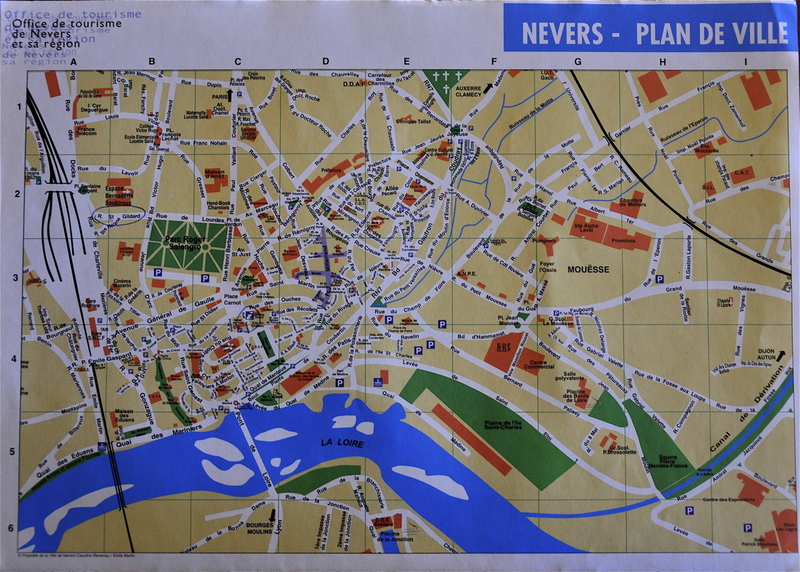 I have posted a photograph of the city map of Nevers here. The gare routiére is located at point A3, the gare SNCF at A4, the transports urbains bus at C3, and the taxis at B4. (Click on the map to have a close-up view of the area). The chapel seems to be walking distance from the gare routiére at point A3 and the the gare SNCF at point A4. There is a taxi stand indicated on the map at the gare SNCF. I am visiting nevers in November, how far is the chapel from Nevers Train Station and how do i go there? I went to Nevers by car, so I cannot answer this question, but perhaps someone else here can. The Nevers train station is located on Rue Saint Charleville and the Espace Bernadette is at 34 Rue Saint-Gildard. Taking photographs inside the chapel is NOT allowed. However, if it is for a specific reason and as long as St Bernadette’s casket is not photographed, it may be allowed. could you email me picture of inside St. Gildard Chapel? See the discussion forum here: http://answers.yahoo.com/question/index?qid=20090115232433AAzsYTw that answers your question. Go to the sncf website at http://www.voyages-sncf.com/ for more information. Could someone let me know how to get to Nevers from Lourdes by train. Espace Bernadette is a house of welcome, reserved for pilgrims who wish to come either individually or in organized groupes, as well as individuals wishing to make a retreat or just to come for some spiritual refreshment. It is not a hotel. A total of 200 places is divided over 100 rooms with 1 – 3 beds (Basins in every room, toilets and showers on every floor, car park). Distances from Lourdes to Nevers are a rough measure only showing the shortest distance as the crow flies, using longitudinal and latitudinal points. * All times are for illustrative purposes only and should not be relied upon as actual journey times. Check with your travel company for precise journey times between Lourdes and Nevers. Train times assume non stop, air times include 30 minutes for take off and landing. For driving directions and journey times try our new improved Google Maps integration below. Would anyone who has up-to-date information on how to get to The Convent of St. Gildard from Lourdes contact me via e-mail. Thank you very much!